In digital imaging, some people think "the more pixels the better." While this may be true for print media, there are actually cases where having too many pixels can cause problems in your screensaver. Here are some hints and tips to consider. 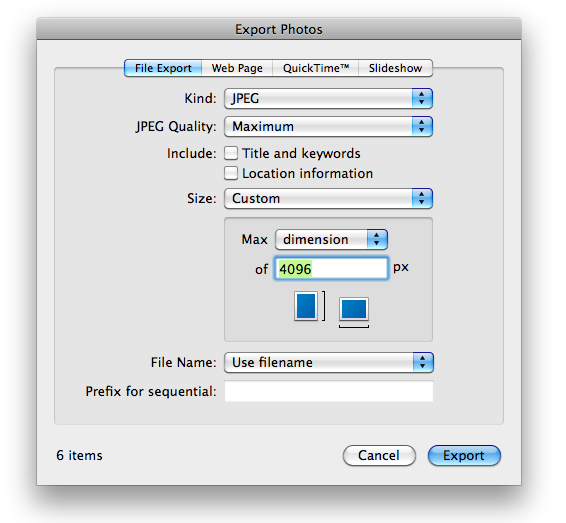 QuickTime and iScreensaver have a maximum image size of 4096 pixels (either width or height). While iScreensaver can resize images during the build process, for best results, use source images smaller than this size. OpenGL graphics cards often have limits that are significantly lower. For example, older cards often max out at 1024 pixels maximum width or height. Fortunately, iScreensaver will automatically reduce the size of the image during playback. Unfortunately, this reduction process can slow down performance. Some OpenGL cards, when presented with large images, will automatically go into S3 Texture Compression mode, which reduces image quality. It may seem counter-intuitive, but providing a Larger image size may actually result in Lower image quality. Larger size images will perform more slowly. Remember that if you increase the image width and height by 2, you are increasing the size by a factor of 4 (2x2) and the overall performance may be 75% lower. Larger size images are, well, larger. Remember that if you increase the image width and height by 2, you are increasing the file size by a factor of 4 and the final file size may be 4x as large. Reduce all images to a maximum of 4096 pixels width or height before importing into iScreensaver. Inside iScreensaver, use image compression to reduce image sizes to a size appropriate for the target screensaver. Modern computers: 2048x2048 maximum, with JPEG level 4 or 5, is a good compromise. Older computers (built before 2008 or those with cheap graphics cards): 1024x1024 maximum size, with JPEG level 5 or 6. When building, watch the build log for warnings & errors. Look at final file sizes to be sure you don't have any outliers. Create an album of the image files you wish to use. From the FIle Menu, choose "Export" and use the settings shown. Find the exported images, and drag these files into your iScreensaver project. Note: one downside of this technique is that you'll lose meta information (Title, Description) in iPhoto. So if you can, it's better to use another method. copyright ©1995-2019 xochi media inc Xochi™, XochiMedia™, iScreensaver™, iScreensavers™, iScreensaver Designer™, iScreensaver Classic™, iScreensaver Personal™, and the DoubleRing logo are trademarks of Xochi Media Inc.
Space imagery courtesy nasa.gov and ESA/Hubble; no NASA or ESA endorsement, nor sponsorship of iScreensaver implied. All other trademarks are the property of their respective owners. Created for you in California. We strongly support the international Paris Agreement - together Screensavers and EnergyStar save energy.